My subjects are mostly places I know well, that I have visited often, building up a picture in my head of many past visits. I try to capture more than a fleeting impression, but a mix of senses and feelings built up over a period of time, rather than a factual representation of the place. I try to convey the dramatic energy of the weather and the vast scale, grandeur and remoteness of the highlands with its ever changing weather. I often use a working method that is challenging and intense, paintings grow from the canvas often with no preconceived ideas, sometimes not knowing what I'm painting until near the end, they are often a journey in themselves as I pour, splatter, scratch, add & subtract paint. 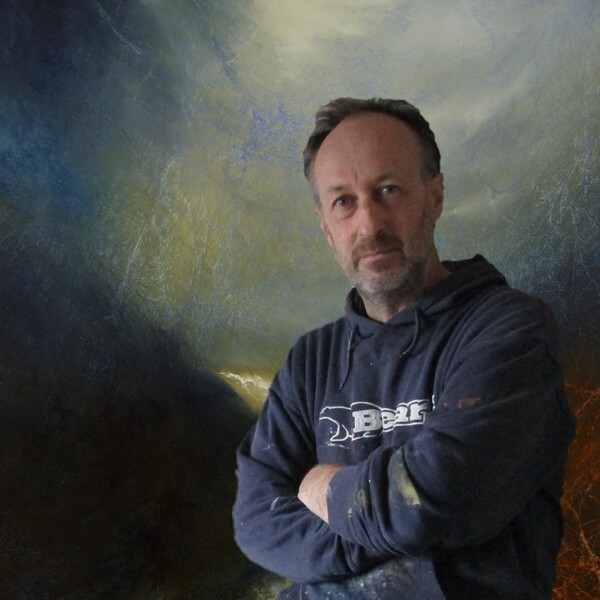 ​A painting that started as a mountain range in Perthshire can become a Hebridean seascape! Inspiration for my art is drawn from my many wanderings in my youth through Glen Esk and the Angus glens, the Cairngorms and further afield on the west coast highlands and islands. As well as travels throughout much of Britain, Ireland and Europe. I am now based in Caithness, although I have lived and travelled extensively throughout Scotland especially the west coast highlands and islands, Torridon, Sutherland and Skye, which can be seen in many of my paintings. .
After a varied career working on shooting estates in Scotland, a self employed builder in the South of France, London, New Zealand and the west coast of Scotland, with a bit of boat building, yacht delivery, animal wrangling, film extra and market trader along the way. However a few years ago I decided to become a full time artist. 2014 - Inchmore Gallery, Inverness.